Until his passing in 1999, John was on hand to observe the day-to-day activities of the teachers and students. Aki Kawahori exudes the kind of enthusiasm that's typical of the students at Roberto-Venn. Collings Guitars, Santa Cruz Guitar Co., Fender, Gibson and many others recruit their graduates. In the photograph below, William Eaton (right) and I are working on a repair project for the students. William, his music and his instruments were featured recently in Acoustic Guitar Magazine. He is the director of the Roberto-Venn School, and a fine luthier himself. The instrument is the original double neck guitar made by John Roberts 25 years ago. It suffered a small crack and several dents in a fall while being photographed the day before my lecture. Not the best coincidence, but a good subject of conversation and instruction! That's the school's director, Bill Eaton, looking on from the back. 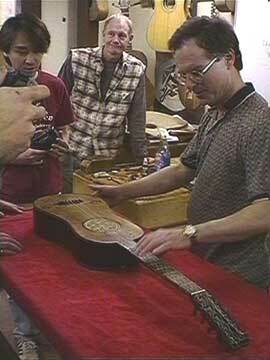 More about that 400 year old guitar.